They say variety is the spice of life, and that’s especially true where accessible trails are concerned. Of course accessibility is great, but that doesn’t mean that accessible trails have be flat, level and boring. Accessible trails that offer unique scenery, undulating grades and opportunities for wildlife viewing are also in high demand. 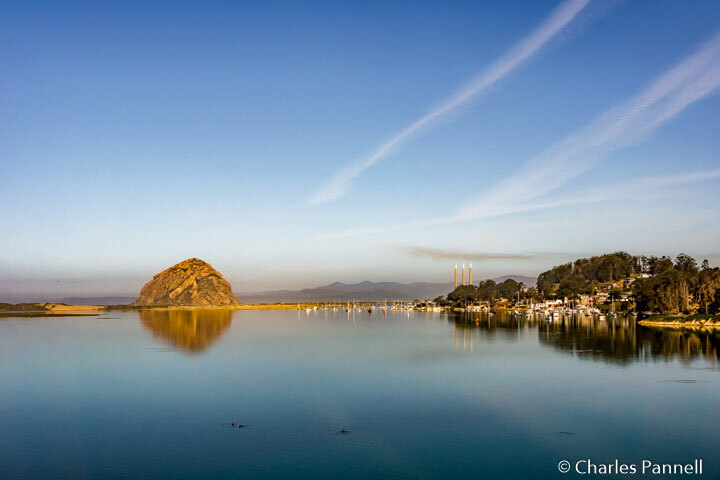 And the Central California Coast is ground zero for these types of trails, where wheelchair-users and slow walkers can get up-close-and-personal with Mother Nature and enjoy the diverse ecosystems of the area. 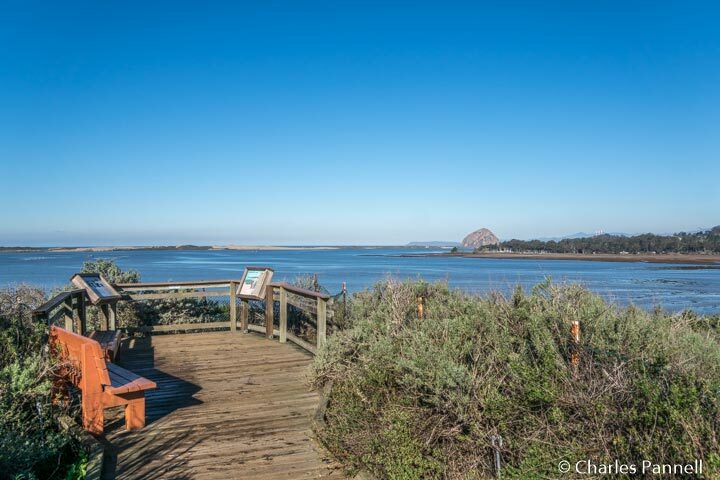 Located in Los Osos, the El Moro Elfin Forest Natural Area (www.elfin-forest.org) tops the list of must-do trails, both for the diversity of the plant life found there, and for the challenging nature of this accessible trail. It should be noted that this trail falls within the accessibility guidelines; however it’s far from straight and flat. It’s also a bit off-the-beaten-trek, so it’s usually not very crowded. From Highway 1 take exit 277 and follow the signs to Los Osos and Baywood Park. Turn south on South Bay Boulevard, drive 2.5 miles and take a right on Santa Ysabel Avenue. From there, drive two blocks and turn right on 16th Street — look for the accessibility pictogram on the street sign — and continue along to the trailhead at the end of the road. There’s accessible parking in the small lot, and level access over to the boardwalk trail that leads through this 90-acre natural area. The 1.5-mile hike includes treks out-and-back to two overlooks, as well as a short spur into an unusual oak forest. There are low bumpers along the boardwalk to allow for unobstructed views of some decidedly unusual plants. From the colorful fuchsia-flowering gooseberry bushes, to the grove of pygmy coast live oaks, diversity is the key word in this forest. Pick up a trail guide at the trailhead, and take the boardwalk in a clockwise direction. And don’t miss the short walks out to Bush Lupine Point and Siena’s View, where you’ll be treated to panoramic views of the estuary which supports a sizable bird population. Be sure and stop and see the Rose Bowker Grove, which is filled with 12 -foot tall dwarf oak trees, which would normally reach heights of 50 feet in other habitats. These 200-year old elf-like trees also served as the inspiration for the forest name. It should be noted that this boardwalk trail goes up and down the hill; however it’s well within the required grade, and there are level spaces about every 30 feet. That said, it will be a challenge for manual wheelchair-users who are not in top shape, as it requires a lot of upper body strength to navigate this boardwalk. Still, the trail offers a good workout for manual wheelchair-users, and some nice variety for power wheelchair- and scooter-users. Diversity is also the key word at Fiscalani Ranch Preserve (www.ffrpcambria.org), a 437-acre tract of protected forest, riparian habitat and grasslands along the Cambria coast. 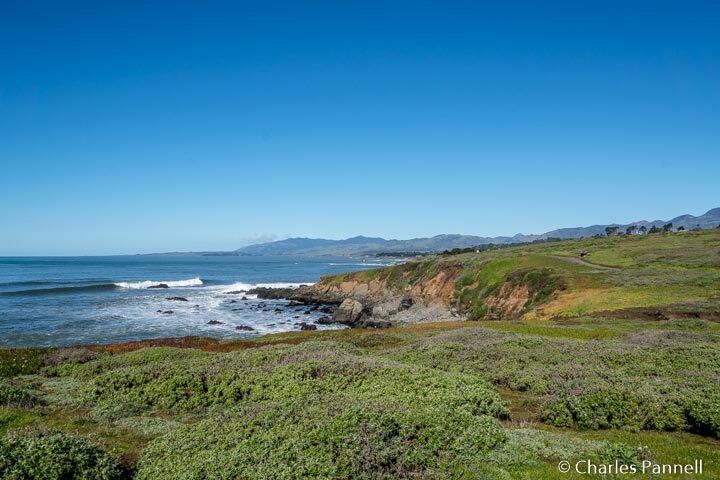 Located off of Highway 1, the west section of this natural area is sandwiched between two upscale housing developments, and offers wheelers and slow walkers a pair of accessible coastal trails. To get to the accessible trails, go west on Windsor Boulevard from Highway 1, and continue through the subdivision until the road dead ends in a small parking area. From there, take the driveway to the left to reach the accessible parking lot, which features level access to both the Bluff Trail and the Marine Terrace Trail. The Bluff Trail begins as a boardwalk and transitions to a hard-packed dirt trail that hugs the coast and overlooks the rocky coastal bluffs. It offers the classic coastal view of waves crashing against the rocks, and there are several benches along the route if you’d like to stop and take a break. The one-mile trail ends in another neighborhood; and although most manual wheelchair-users will have to double back at this point; power wheelchair- and scooter-users can access the Marine Terrace Trail with a short — albeit steep — jaunt through the adjacent subdivision. From the end of the Bluff Trail continue into the neighborhood and take the first left, on Wedgewood Street. Go up the road and then take another left on Marlborough Lane, which dead ends in a block at the Marine Terrace Trail. 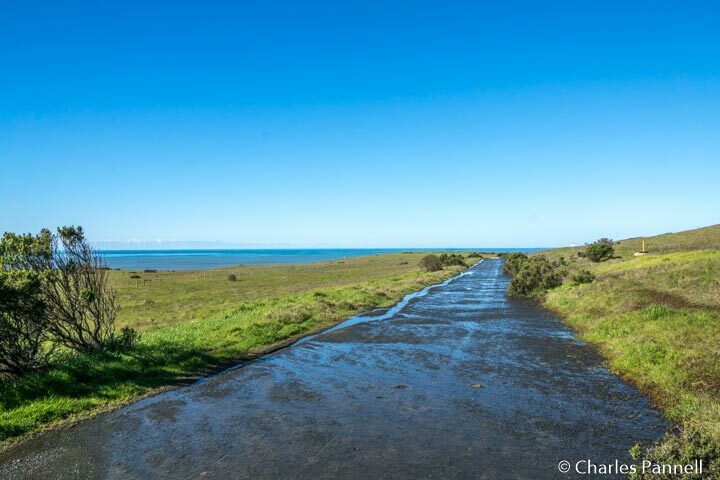 The wide level dirt road doubles as a fire road, and offers a totally different view of the coast. It’s an easy one-mile roll back to the Windsor Boulevard accessible parking lot, and as an added bonus, this trail sees less traffic than the Bluff Trail. Alternatively, manual wheelchair-users can do an out-and-back on the Marine Terrace Trail from the Windsor Boulevard trailhead. 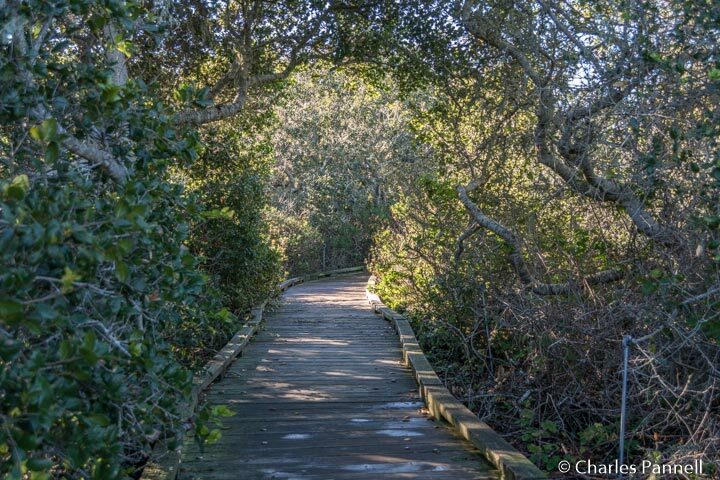 Either way, both of these trails offer a scenic accessible stroll along the coast. Another accessible coastal stroll — the Moonstone Bluff Trail — is located a short drive north of Fiscalani Ranch, off of Highway 1 in Hearst San Simeon State Park (www.parks.ca.gov/?page_id=590). This barrier-free boardwalk begins near the Leffington Landing day use area, where you’ll find accessible parking and an accessible porta potty. And if you’d like to take a lunch break, there’s also level access over to several standard picnic tables in a nearby hard-packed dirt area. To get to the boardwalk, take a right out on Moonstone Beach Drive and cross the bridge. This road is level and there’s plenty of room for a wheelchair or scooter to safely navigate the .1-mile walk to the boardwalk. There’s also a small pullout with space for a few vehicles to parallel park near the boardwalk, but it’s usually full. The 1.4-mile boardwalk winds along the beach and offers some panoramic ocean bluff views. It’s level and accessible for its entire length and it’s easily doable for just about everyone. It makes a nice 2.8-mile out-and-back trek, however you can do as little or as much of the trail as you like. 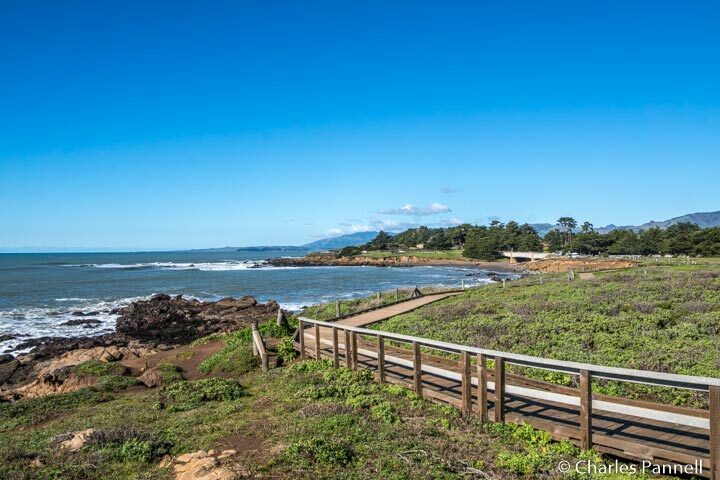 Even better, since the trail features a number of access points from nearby Moonstone Beach Drive, even folks that can’t walk very far can enjoy the ocean views. This is truly a trail for everyone. No Central Coast visit is complete without a stop at Elephant Seal Boardwalk (www.elephantseal.org), which is also located in Cambria, about 4.4 miles north of Hearst Castle on Highway 1. 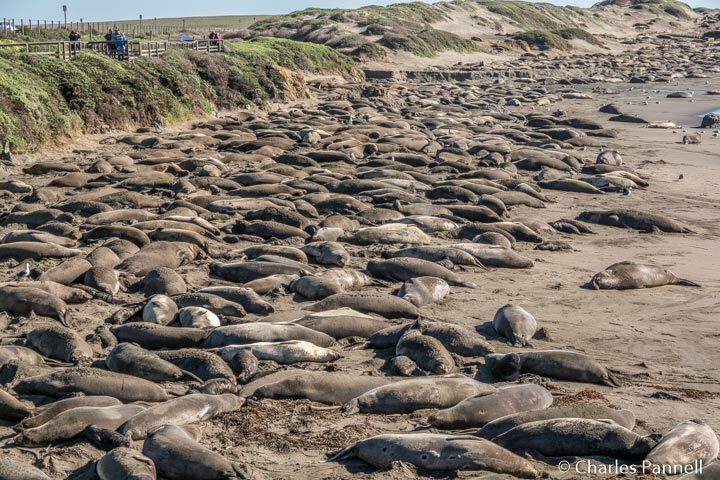 It’s easy to find — just look for the “Elephant Seal Vista” sign. Accessible parking is available near the hard-packed dirt trail over to the boardwalk. All in all it’s about a quarter-mile to the end of the accessible boardwalk; but you can get a good view of the seals just steps from the parking area. 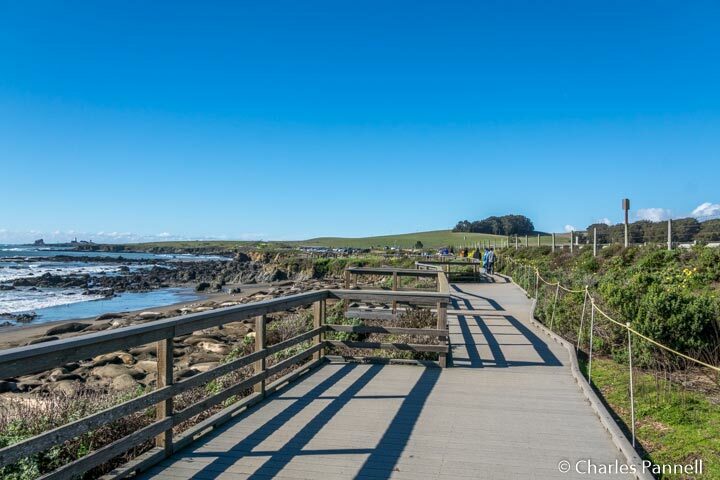 In fact, from December through March you’ll find them lazing on a six-mile stretch of beach between the boardwalk and the Piedras Blancas Lighthouse. To be honest, the boardwalk itself is unremarkable, and it’s truly not a huge attraction when the seals are absent. Indeed the elephant seals — named for the large noses on the males — are the stars of the show. Although the rookery has a small number of year-round residents, peak activity begins in December when the males stage dramatic bloody battles for dominance. The pregnant females begin to arrive in mid-December and form harems around the alpha males. Birthing takes place shortly after the females arrive, and by mid-February the beach is filled with seal pups. The colony significantly dwindles by the end of March, and although some seal activity can be observed in the off-peak months, nothing beats the seal sightings in the first two months of the year. Additionally, docents are on duty during the winter months to answer questions and explain seal behaviors. As they say, timing is everything, so plan accordingly to make the most of your visit to this popular boardwalk.